CRC construction. With lock and key. Dimensions (LXWXH): 610X460X1525mm. Pre-treated & Epoxy powder coated finish. 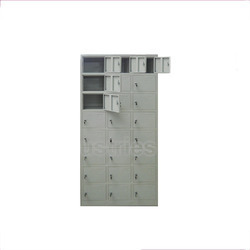 Available with us are Staff Lockers that are offered to our esteemed customers. Possessing the features of high strength and durability, our gamut of staff lockers is of great demand in various industries and sectors. These lockers are manufactured using optimum quality raw material at our sophisticated infrastructure unit. We are a prominent manufacturer and supplier of School Lockers . Shri Hari Industries are a Leading Exporter, manufacturer and Supplier of a diverse and a customize range of Security Lockers. No of Lockers: as req. We are offering Industrial Locker.